TomTom's 3rd edition update to the world's bestselling (as of this writing, 8/30/08) portable navigation device features an updated chipset that provides better satellite lock and TomTom's new MapShare technology that lets you add your own map corrections and points of interest, then upload your corrections to and download other corrections from millions of other TomTom users via the TomTom HOME website. 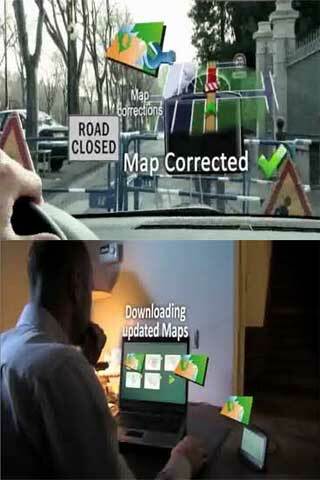 The TomTom ONE's 3D driving view offers a clear picture of the road and maneuvers ahead. See the ONE in detail. The device's icon-driven menu system makes using the ONE a snap. 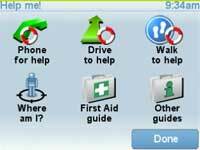 Emergency menu gives you fast direct access to emergency numbers and direction to the nearest assistance. Voice instructions are available in over 30 languages. Tom Tom even has comedy and celebrity voices available. MapShare lets you add your own map corrections and POIs, then share them with the entire TomTom user community via the TomTom HOME website. Even though the ONE, 3rd Edition is TomTom's entry-level portable GPS vehicle navigation device, it remains a complete solution with an incredible range of features. A sleek design and a sharp display combine to make the TomTom ONE a vital companion on the road. THe ONE, 3rd edition comes pre-loaded with complete maps for the United States and Canada. Weighing less than 10 ounces and measuring 4.33 x 3.5 x 1.34 inches, the TomTom ONE can be easily installed in any vehicle. An included windshield suction mount holds it in place. Plus, with an operating temperature range of an icy -10 degrees to a sweltering 55 degrees Celsius (14 to 131 degrees Fahrenheit), the navigator is durable enough for New England winters or Arizona summers. The TomTom ONE is powered by an internal lithium ion battery that can be charged from your vehicle's cigarette lighter with the included 12-24V adapter. The user-friendly design also puts it a step above other navigation systems. The crystal-clear multicolor display makes for exceptionally easy viewing of maps, routes, driving directions, and other traveling information, such as mileage and distance. Measuring 3.5 inches, the TFT display offers a resolution of 320 x 240 to provide brilliant two- and three-dimensional graphics. The device also features 32 MB RAM and 380 MHz CPU, making it responsive and zippy. Using the USB port and the provided cable, you can use your PC to add your own points of interest. With its touch-sensitive screen, the TomTom ONE puts programming and operation literally at your fingertips to make sophisticated technology simple. The built-in database offers millions of points of interest for you to use as destinations or reference points as you plan your trip. ONE will also provide a selection of available routes, giving you the option of avoiding toll roads or choosing between the quickest or the most scenic routes. The database includes zip codes to simplify your route selection, and for extra convenience, the TomTom ONE lets you save the addresses of frequent destinations, making route planning easier and faster than ever. Other display features include a compass mode to assist you with directional orientation, and an anti-glare screen for optimal viewing even in direct sunlight. ONE provides clear and accurate turn-by-turn voice instructions, so that you don't have to take your eyes off the road while your vehicle is on the move. Voice instructions are available in over 30 languages. Tom Tom even has comedy and celebrity voices available, some for free, and others for purchase via download at TomTom's website. One nifty feature is speed-sensitive volume. With this optional feature turned on, your vehicle's engine becomes louder or quieter as your speed changes, the volume adjusts itself accordingly, guaranteeing clear and easy listening. TomTom ONE device, suction mount, car charger, USB 2.0 data cable, and installation CD with connection software and manual. TomTom NV is the world's largest navigation solution provider, developing products with an emphasis on innovation, quality, ease of use and value. TomTom's products include all-in-one navigation devices which enable customers to navigate right out of the box; including the award-winning TomTom GO family, the TomTom ONE range and the TomTom RIDER (for motorcycles). TomTom also provides navigation software products which integrate with third party devices; the TomTom NAVIGATOR software for PDA's and smartphones. TomTom WORK combines industry leading communication and smart navigation technology with leading edge tracking and tracing expertise. TomTom's products are sold through a network of leading retailers in 25 countries and online. TomTom was founded in 1991 in Amsterdam and has offices in Europe, North America and Asia Pacific. Find your way the easy way. TomTom ONE's distinctive design puts a full-size touchscreen and the power of GPS in a slim, lightweight device. Switch on and go right out of the box. The crystal-clear display, 3D graphics and turn-by-turn spoken instructions help you find your way to any address in the US and Canada all with just a few taps of the screen. TomTom has the most accurate maps, and with TomTom MapShare technology you can instantly modify street names, street direction, and POIs on your own device. And now, there are added safety features so you can easily access local emergency providers. No activation, no monthly fees, it's that easy. TomTom ONE is the world's number one selling portable navigation device. AWFUL PRODUCT, STAY AWAY FROM THIS ONE!!!!!!! UPDATE: MY TOMTOM QUIT WORKING AFTER JUST OVER A YEAR OF USE AND SINCE IT IS OUT OF WARRANTY TOMTOM WILL NOT FIX IT. I WAS TOLD BY THEIR CUSTOMER SERVICE TO FIND SOMEONE ON THE INTERNET TO FIX IT!!! I WOULD HAVE PAID THEM TO FIX IT IF THAT WAS AN OPTION BUT IT IS NOT. The TOMTOM is easy to use and is ready to go right out of the box, but I would not recommend this unit to anyone. It has directed me through more back roads, dirt roads and subdivisions than I care to think about. If you like to drive through residential developments instead of the main road then by all means buy this unit. I tried to set the unit for both "fastest route" and "most direct route" with little effect on how it routed me. It once tried to route my through Wisconsin when I was trying to drive back to Flint, MI from the Upper Peninsula of Michigan. On a mountain road in Kentucky, as I drove around the curves it repeatedly told me to make turns-- as if I had any other choice. On most GPS units I have used, you can get an eagle's eye view (zoom out)by hitting the minus key on the unit. On the TOMTOM, you have a very limited overview function, maybe only 2-4 miles ahead. If most of your trip is going to be on the same highway, it is impossible to visually check your progress due to the limited zoom function. When you use the minus key to get an overview of the route, as soon as you get near any cross road, the unit jumps back to the default zoom. I find this unit to be a constant irritation when driving. The voice commands are incessant. It seems to nag more than instruct. It tells you over and over that a turn is coming up. I usually turn the volume down on the TOMTOM so I can barely hear it. The battery life is very short. It must be plugged in to the cigarette lighter while in use. It did not come with a wall plug. If you parked your car and went on a walking tour of a city with the TOMTOM it would be of very little use to you. My TOMTOM battery life is only about 20 minutes, forget about using it on a bike trip, though the unit does give you routing options for bike trails. 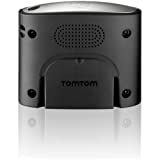 I purchased the tom tom on amazon and it was another company that I actually purchased it from. It came the next day with a nice case inside for a camera free of charge. I have never had such good service before. Usually things take forever from Amazon when there is free shipping. The shipping was free and the best service ever. Amazon could learn something from this companies shipping times. I found the new tomtom ONE 3rd very interesting. First of all, it is way better than Garmin/all series due to one important fact : None of Garmin GPSs will show your turning direction on the bottom, they all point it directly in the map which is useless in some occasions. This is a good product for a guy like me that goes on vacation twice a year. It is easy to update easy to use and very practical for work related trips. It's like a cell phone....you're not always guaranteed you'll have reception. Doesn't do me a whole heck of a lot of good if all it states is "Lost signal 3 minutes ago". I sure wouldn't rely 100% on it...you better also have a hard-copy map in your car for the areas that have no reception. If you approach an intersection where you will go straight, it says nothing. It only speaks when you need to make a turn. When I'm on a long, straight trip, I ride in silence for a long time and then when I finally need to make a turn, the voice actually startles me since I wasn't expecting it and hadn't heard it at every intersection. It's got an unusual definition of 'quickest route'. I think mapquest maps out better paths than the TomTom. It seems to take me the long way around quite a bit. It's sure better than nothing. I am completely geographically impaired and can't find my way through my own backyard! It gives me much more confidence in taking road trips alone and I'm not as stressed out trying to read my mapquest print-outs and reset my odometer to know when to turn. It's great to know that I'll be notified when it's time to turn and I need not worry about what my next step is. (For as long as I have a GPS signal, that is). So, I would not say that I regret buying it but I was hoping it would be better than it is. I'm sure glad I didn't buy a $400 model or something! Well someone has to get the bad units and judging by all the refurbished units on the market I would guess these have a higher then normal failure rate. I purchased ours a little over a year ago and we haven't it used much. It has probably been powered on less then 50 times total. Yesterday the little guy locked up and despite trying to use the reset button and even letting the battery fully discharge it is stuck on the intial TOmTom screen everytime it powers up. When we did use it the maps were easy to follow and it would get us to where we needed to go but the routes were not always the most direct and even when I would have thought the next obvious route would have been the second choice when hitting the recalculate route button, that was not the case. Often the recalculated routes would take you far out of your way and miss the obvious choices (like main highways leading directly to your destination). So even if you were to discount my one star rating as coming from a disgruntled owner of a bad unit, I would have given this unit only 3 stars if it were still working. I have an entry level Garmin and like that a little more. Even at just over $100 dollars per unit I have an expectation it will last more then 50 power up cycles. My wife and I just got home with this device, and we are amazed. We feel this will greatly simplify and enhance our travel experiences. 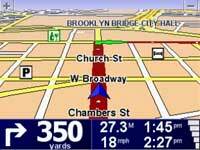 If you are already a GPS user, you may want something fancier. So far I have found that you can only plan one point of interest in a trip and I have found some of my favorite stores, mostly small or specialty businesses, that are not included with the points of interests. Since the device is inexpensive, it fails to offer an SD slot for more memory. It also cannot play mp3s, display photos, or anything else that is fancy. For basic or beginning users, purchase this unit. Allow me to espouse the great things about this device. SIMPLICITY The Tom Tom One had the easist to use navigation menu of any device I looked at. The menu is ran completely with the touch screen and my wife and I can both use it with ease. When you first turn the unit on it asks you to set your home address and choose your settings. A cheaper version that my father received for Christmas took him an hour to figure out! The screen is extremely visible with vibrant colors and great brightness. It locks onto a GPS signal almost instantly. Setting a route to a destination is simple. 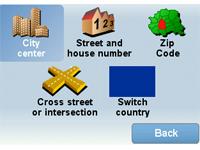 If you are wanting to return to your home, you need simply press 2-3 buttons on the screen. To get to a point from your current location, simply add a few steps by entering an address or choosing a point of interest. FUNCTIONALITY If you have a favorite store, friend, family or other location, you can easily add the location to your favorites with a name of your choosing and that makes sense to you. If you have ever added a Internet site to your web browser favorites, you can do this and love it. The internal memory contains tons of points of interest from hospitals to restaraunts to shopping centers that you can easily search. You can search for these by points nearest your location, points along your route, or points near your destination. The voice prompt is loud and easy to hear. You can even set the volume to increase as your driving speed increases. The settings allow you to customize the screen to show what you want to see such as a compass, points of interest, remaining time and remaining distance. As much as I love this device, I caution anyone to be aware that this device will meet all of travel needs. Browsing a map is not easy, so I will probably still print and study Mapquest maps of any area at which I will be staying. If you want to visit multiple locations on a trip, you may still need to make a list of addresses you want to visit. Since I don't trust the device's list of points of interest to be as comprehensive as I would like, I will definitely google things I want to do in an area. However, it will be very nice now to locate gas stations or restaraunts that are near our hotel or along our route. As a hater of driving in big cities, I also think we will be more adventerous and willing to venture into large metro areas. Ordered this item for my granddaughter and she had gotten one herself.